After Captain Marvel, will Pia Wurtzbach be introduced as the next Marvel heroine? 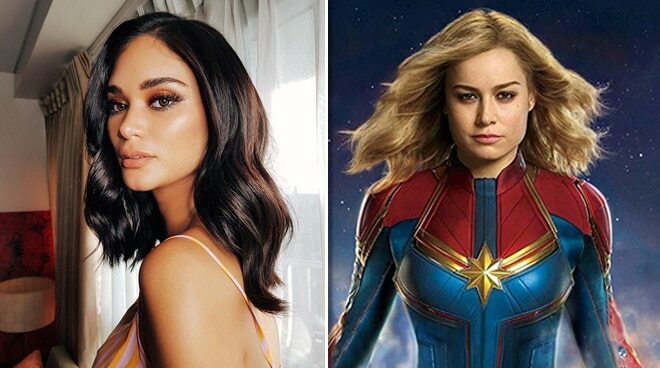 Pia Wurtzbach, who had the opportunity to do an interview with Captain Marvel star Brie Larson, addressed fans who want to see her take on the role of a Marvel heroine. With several fans looking forward to seeing her in one of the superhero franchise’s future films and take on the role of a Marvel heroine, Pia Wurtzbach took the opportunity to address them without closing any doors. “I don’t know about that. We’ll see. It’s always gonna be a dream for me to one day play a superhero so tignan natin kung mangyayari ‘yan sa Pilipinas o sa abroad,” she said during an interview at the special advance screening of Captain Marvel. Pia, who admitted that she is a big fan of Doctor Strange, wants to have a superpower where she could manipulate time. “I really love Doctor Strange. Like I love the concept of being able to control time. ‘Yun ‘yung talagang gusto ko. Like to be able to manipulate that in some way, like that would be really interesting to do. But ideally, in real life, just to be a strong woman like Captain Marvel would be good enough,” she said. Though Captain Marvel isn’t as popular as the rest of the superheroes from the whole Marvel Cinematic Universe, Pia believes that given the fact that she is the most powerful among all of them, people should see her slay on the big screen. “She’s stronger than Iron Man, stronger than Captain America. Strongest. So it will be really interesting how that all happens in the story in the movie,” she said. Last month, Marvel Comics revealed that the Stan Lee-founded company will introduce a new set of Asia-based superheroes called The War of Realms with a Pinoy heroine named Wave joining the team. Meanwhile, Captain Marvel is now showing in cinemas nationwide.